2. 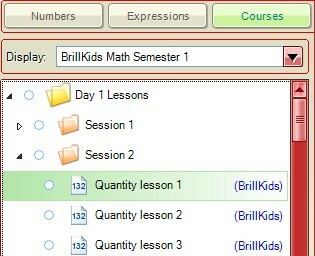 Click on the Play Courses / Play & Edit button at the top of Little Math. 3. Select the lesson in which you would like to change the speed of its slide transition. 4. Click on the Settings button in the Preview Panel on the right side of the window. 5. Click on the Auto Forward button at the bottom left of Little Math to enable the Auto Forward setting, which allows you to play back presentations continuously, without needing to click a mouse button or press the spacebar to proceed to the next slide. 6. To adjust the Auto Forward settings, click on the cog button next to the Auto Forward button. 7. The Auto Forward Settings window will show up. You can adjust the duration of each slide by moving the sliders below Auto forward delay and Delay between equations. Delay between equations - Change how much longer Little Math will wait after the end of the current equation before playing back the next equation. Using Auto-Forward in combination of Delay between equations can further increase or decrease the speed for your lessons in Little Math. 8. If you want to apply the same Auto Forward settings for ALL lessons, click on the Override button at the bottom right of Little Math to enable the Override setting. 9. Click on the cog button next to the Override button. 10. Click on the Numbers tab, then click on the the Auto-Forward button near the bottom left of the Override Settings window. 11. In the Auto Forward Settings window, click on the button and check the box next to Auto-Forward slides (the light will turn green) to enable Auto Forward settings for all Little Math lessons of the specified type. For example, if you turn on the Auto Forward function under the Numbers Tab, all Numbers lessons will be affected by this setting. Then, start customizing the settings by adjusting Auto forward delay and Delay between equations. 12. Click on the Expressions tab and repeat Steps 11 to enable the Auto Forward function. 13. After you are done, click on the SAVE button to save the settings.